A maniacal gamer makes trouble for the Doctor and his companions. Okay, let’s discuss why the Celestial Toymaker hasn’t been back on Modern Who. I know I will encounter him again in audio adventures and various stories throughout the novels but the character hasn’t been back on TV and this needs to be rectified. Maybe it’s the use of the Mandarin costume (which should not be replicated because holy racism, Batman) but there has to be some way that the Toymaker comes to Modern Who. The character is fun and I would love to see Capaldi’s responses to the Toymaker’s snide remarks. The entire episode is a series of games in which Dodo and Steven must play in order to win back the TARDIS. The Doctor is forced to play a separate game in front of the Toymaker. If the Doctor wins the game before Dodo and Steven reach the TARDIS, the Doctor actually loses and Dodo and Steven become dolls for the Toymaker’s amusements. The entire structure of the installments and novelization rely on the interactions between Dodo and Steven. Apparently, William Hartnell was on holiday during the shooting of installment two and three, hence why there are parts in which the Doctor has been silenced or you only see his hand. Dodo and Steven make the story work well and there is a fondness between them that allows the reader/viewer to want to see them succeed. I’m glad that this book pointed out Steven’s constant rashness. There’s even a line in which Dodo is described as being “…irritated…(with)…Steven’s tough guy attitude…” Why was he written this way? There are brief moments when his snarly attitude breaks free and I can see an opportunity in which he could have became my favorite, but then it passes and I’m left with the annoyed face. I want to like him but he’s a product of his time. (Not his character’s time but the time of the episode’s production.) Then again, Ian wasn’t this bad. Again, stomach through until the end. The story itself is fun and light. The problem I’ve been having with some of these episodes has been the larger than life, intense storylines. The Daleks’ Master Plan nearly killed this blog as it became a drag to get through the storyline. Having recently finished the 9th series of Modern Who, I appreciate the balance of humor with serious with the placement of the episodes. I know that I’m not watching these classic programs in the manner that they were presented (a 30 minute episode once a week) but I can’t help but grumble. One idea that I might try in the future, once we’re past the First and Second Doctor with their missing episodes, is to only watch one part of the serial a day. That way I can process the episode as it was presented instead of binge watching the episode with multiple parts in one sitting. 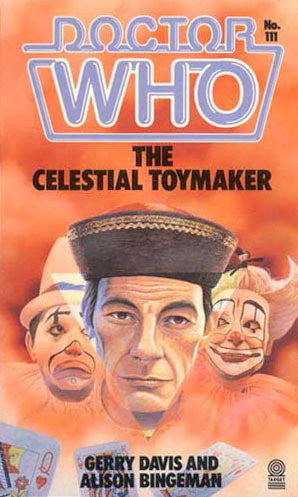 The last installment of The Celestial Toymaker was fun to watch as it is available on the Out of Time boxset. The ending didn’t feel cheap and it did leave the possibility for the Toymaker to return in the future. (Please let the Toymaker come back for Capaldi’s next season. PLEASE!). The entire story was a lot of fun and worth the time and effort to find and read. The Toymaker is played by Michael Gough, who would later play Alfred Pennyworth of the Batman films. He was married to Anneke Wills, a companion of the Doctor starting in Episode 27.